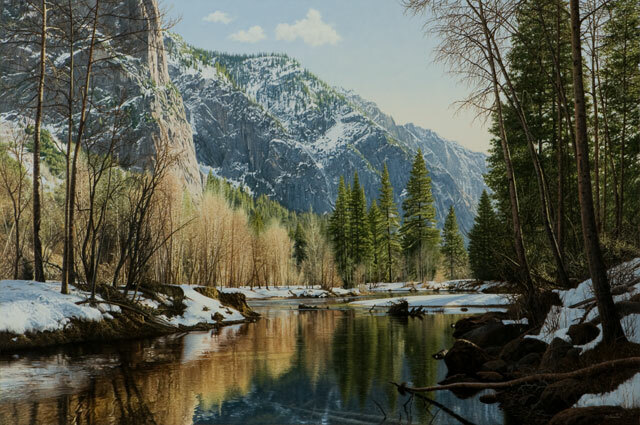 Three Rivers artist, Denis Milhomme, will be showing his work at the 2011 Masters of the American West Fine Art Exhibition and Sale, considered the country’s most important Western art show. The exhibition runs from February 5- March 20, 2011, at The Autry National Center in Griffeth Park in Los Angeles. Each year, more than 75 nationally recognized, contemporary Western artists challenge themselves to create and exhibit their very best work. Stylistically and thematically diverse, their works represent the extraordinary range of subject matter that contemporary, historic, and mythic Western experiences inspire. Denis Milhomme spent his formative years in a small New England town, where he received art lessons from the age of eight. After moving to California he continued his study of art through college and in workshops, and he has been painting professionally since 1983. Milhomme tries to bring to all who view his work a realistic glimpse of nature’s beauty. His use of detail, color, and composition helps create the emotional impact of actually being there and depicts his great love of nature. He has explored the American West from its mountains to its deserts, capturing its grandeur. This entry was posted in Denis Milhomme and tagged Autry Center, Denis Milhomme on January 12, 2011 by Elsah.